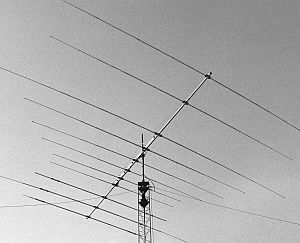 The Hygain TH-7DX is a 7-Element yagi antenna for 10m, 15m and 20m. No compromise in performance and a F/B ratio of 27dB promises Hygain from the TH-7DX. In all bands the SWR is better than 2:1 even on the entire 10m band. The construction is a unique combination of parasitic and trapped monoband elements. The antenna consists of a diecast aluminum, rugged mast clamp, thick element holders and is supplied with the BN-86 balun. The boom length is 7.32 m and the longest element is 9.45 m long. The maximum transmit power is only given as "Maximum Legal". The Hygain TH-11DX is a 11-Element yagi antenna for 10m, 12m, 15m, 17m and 20m. The Hygain TH-11DX is known world wide among the radio amateurs. The antenna stay for excellent signals anywhere in the world. The TH-11DX operates like a Logperiodic and has for 17m and 20m own mono-band reflectors. The scope of delivery is the high-power balun BN-4000, which can be loaded with 4 kW PEP (2kW continuous wave). In addition to the hardened aluminum only stainless steal parts be used.